Basically this type of heater is applied in plastic injection moulding machines of various makes. It is also used for heating dies, plattern pipe sections, nozzles etc. Sheathing - rust resistant steel, brass or stainless steel are used with clamps & screws to affix the heater rigidly on cylinder. It is also available in two halves with asbestos heat insulater cover. Heating elements - Nichrome ribbin wire wound mica strip are made suitable to the sizes insulated with mica blocks. The element is wound uniformly to eliminate hot spot. 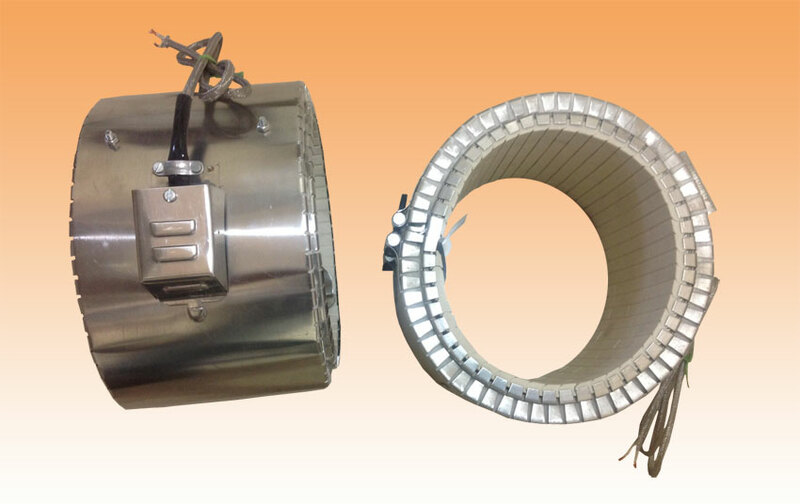 For temperature upto 600°C, the heater is also available with helix coiled element insulated with grooved refractories.